Zulily: Penelope Mack Girls Peacoat and Hats only $21.99! Ahh, I just found the cutest coat for Emma last month but there was no way I was going to spend $55. I couldn’t believe it when I saw it on Zulily today! The exact coat for only $21.99! Zulily is my indulgent daily deal site. They have all the things I’d love to splurge on but don’t. I have a very girly girly here and she is going to love opening this coat at Christmas! If you haven’t already, sign up for your free Zulily account. With the holidays coming up, you might find that exact item you’re looking for! Zulily: Save up to 70% on moms, kids and babies! 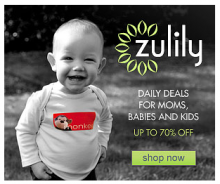 Zulily is another great site for moms, babies, and kids. It’s actually one of my favorites now. I have purchased a ton of really cute shoes for my daughter at 70% off the retail price. I noticed that most of their deals run about 70% off which is a huge savings on such great brands. If you have room in your email for one more daily deal, I would sign up for Zulily. It’s free to join, just submit a valid email address. Also, if you invite your friends to join Zulily, they have a great referral program. You can get $15 credit when they make their first purchase!